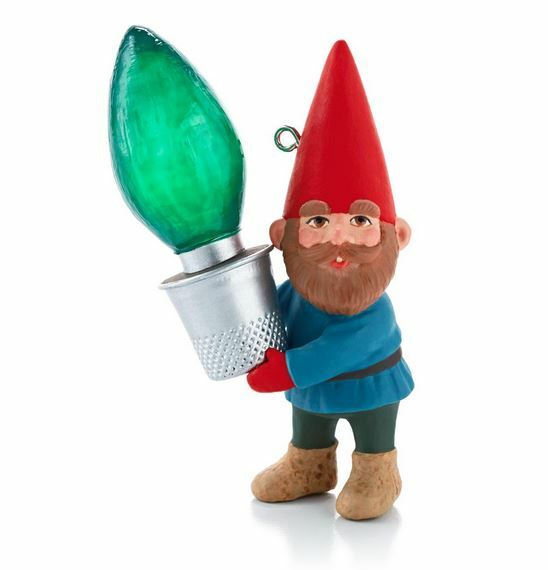 This spritly gnome is bringing home some cherry Christmas light to give the garden or your tree an extra spark and make the season even brighter. This ornament was "collector influenced"
In June 2012, Hallmark conducted a survey, ornament fans were asked to select one of six characters as the bases for a 2013 Keepsake ornament. Survey questions also asked about a seasonal theme for the character chosen, as well as for props or activities the character should be engaged in. At the conclusion of the survey, all the votes were counted and the winner was Julie Forsyth's garden gnome. He will look great in a winter fairy garden! Bright and colorful, too.